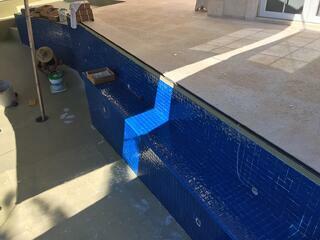 Resurfacing your pool will take away the dull, cloudy and broken look of your current pool finish. You can make the pool match your style and home’s architecture — and you can also find a finish that matches your budget. The larger and more detailed your pool is, the more it will cost. But the biggest determining component with figuring out your resurfacing cost will be the type of finishing material you use. There’s no one-size-fits-all approach with pool finishes. The one you choose will greatly depend on your preferences, budget, style of home, color of home, use of pool and other contributing factors. Diamond Brite is the standard finish. The standard color options are Cool Blue, Aqua Quartz and Super Blue. Diamond Brite lasts eight to 12 years before it fades and gets spotty. We recommend acid washing this finish after about five years to keep it bright. Each style and color has a different price, but a Diamond Brite finish costs about $5,000 to $10,000. We recommend staying away from the darker colors. 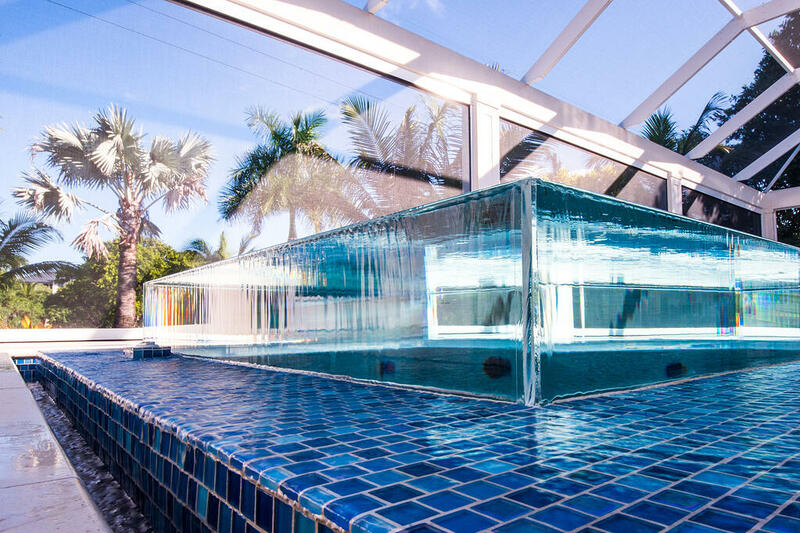 The most expensive of the three options, glass tiles can give you a stunning, high-end pool finish. You can either use the tiles as accent elements along the waterline or on steps, for example, or throughout the entire pool. If you get a full-tile finish, the materials and installation will cost about the same as the entire pool. The typical cost of installing glass tiles is $30 to $50 a square foot. Glass tiles have a great lifespan, helping to offset some of the costs involved. They can get chipped and fall off, however, so they require upkeep and some re-grouting at times. For a more earthy, textured appearance, consider using a pebble finish like PebbleTec or PebbleSheen. These are better options for a darker finish. Some color options with these include Slate Blue, Seafoam Green, Tropical Breeze, Soft White and Black Marble. This option also has a non-slip, stain-resistant surface and shimmers in the sunlight. There are options, like Shimmering Sea, for a distinct sparkle in the finish. It’s similar in price to Diamond Brite. Remember: The pool finish and color you choose will affect the appearance of your water. For example, a lighter finish like Diamond Brite’s Ivory exposed aggregate will make your water look clear blue. You can accentuate these colors even more with underwater lighting effects, if you want to make a bigger statement. Although from the same manufacturer, PebbleTec and PebbleSheen have some distinct differences and looks. PebbleSheen has slightly smaller pebbles compared to PebbleTec, and it’s actually the company’s top-selling pool finish, according to them. PebbleTec isn’t as smooth, so it’s better if you want a more natural look and feel. Both finishes can be enhanced with Shimmering Sea, which adds brilliance and elegance to the pebbles. They are both long lasting and can really make a statement in your pool. 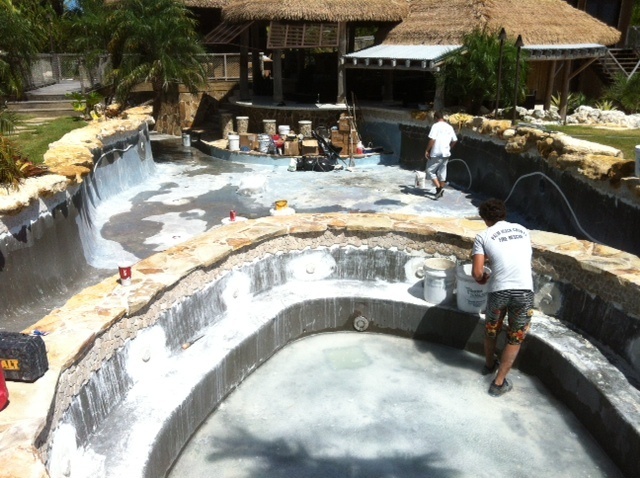 Resurfacing a pool is more than a one-day project and normally requires several experienced team members. Before any work can get started, all of the water must be drained from the pool. The pool needs to be cleaned next and make sure any debris or dirt is removed — that includes the main part of the pool, along with pool steps and the coping, if you’re resurfacing the entire feature. If the concrete shell has any cracks or damage, that’s a good time to prep the pool and have them repaired since it is empty: You want to ensure the pool has a solid structure before moving forward. Any blisters or hollow spots will be removed to ensure a strong bond. With a clean palette, the crew can start to pour in and scrape the plaster until it’s spread out evenly. Then, it’s time to start adding whichever type of finish or design you chose. If you’re tired of looking at chipped, damaged or dull finishes, it’s probably time to resurface your pool. Choose a company that provides high-quality materials and work to ensure your pool is in good hands. Our certified pool team knows what and when pools need renovations and refurbishings — taking the guesswork out of your pool care. We’ll talk with you about your ideas, goals, budget and how you use the pool to come up with finish material suggestions that will best fit your pool and lifestyle. In addition to resurfacing pools, we also offer pool services like installing lighting, waterline and step tile, automation, acid washes and upgrading equipment. We provide pool and landscaping services in Miami, Key Largo and throughout South Florida. You can see us in action on our YouTube channel. Ready to give your pool a facelift so it looks as good as (or better than) the day it was installed? 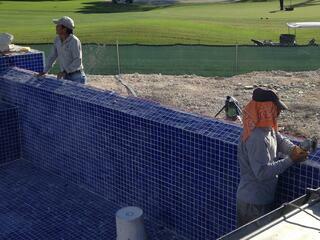 Call us at 305-367-2005, or fill out a form online to see how much resurfacing your South Florida pool will cost.